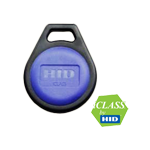 NOTES: HID, the HID logo, ProxCard, ISOProx, ProxKey, and MicroProx are registered trademarks of HID Global Corporation, an ASSA ABLOY company. 2k bit. For use with iCLASS and multiCLASS reader lines. Dye-sub printable. Specify site code and starting ID when ordering. Not for use on biometric readers. 2k bit. Peel and stick patch to add iCLASS technology to existing credentials or devices. For use with iCLASS and multiCLASS reader lines. Diameter 2.75 cm. Specify site code and starting ID when ordering. Not for use on biometric readers. 2k bit. 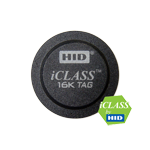 Keytag for use with iCLASS and multiCLASS reader lines. Specify site code and starting ID when ordering. Not for use on biometric readers. 16k-bit. Stores user's fingerprint template for reliable and secure access to all Zodiac iCLASS fingerprint readers, HID iCLASS and multiCLASS reader lines. Specify site code and starting ID when ordering. NOTE: Card ID programmed by user must match card ID printed on the card. 16k-bit. 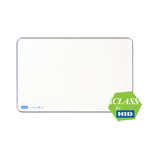 Peel-and-stick patch turns any card, or other portable item into an iCLASS credential for reliable and secure access to all Zodiac iCLASS fingerprint readers, HID iCLASS and multiCLASS reader lines. Specify site code and starting ID when ordering. NOTE: Patch ID programmed by user must match patch ID printed on the patch. 16k-bit. Stores user's fingerprint template for reliable and secure access to all Zodiac iCLASS fingerprint readers, HID iCLASS and multiCLASS reader lines. Specify site code and starting ID when ordering. NOTE: Keytag ID programmed by user must match keytag ID printed on the keytag.